We will be going to this most definitely (some of our work is in it!!). Come along and have a look and join us for the after party at The Old Police Station on Friday the 26th Feb 2010. 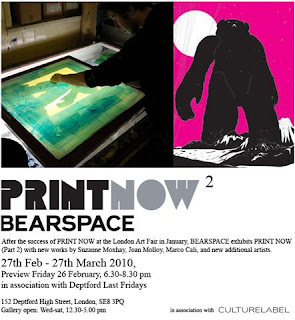 After the success of PRINT NOW at the London Art Fair in January, BEARSPACE exhibits PRINT NOW (part 2) with new works by Suzanne Moxhay, Joan Molloy, Marco Cali, and new additional artists. PRINT NOW is an innovative exhibition of new works by over 100 emerging artists based on the concept of PRINT as a medium and a repetitive process. Works range from sculpture constructed from recycled printed fliers, to etching on aluminium and lithograph. Artists have been selected by a panel of curators and writers, specifically concerned with emerging art, including Julia Alvarez, Director of BEARSPACE, Kay Saatchi, collector and curator, Pryle Behrman, writer and curator of Art Projects at the London Art Fair and Mike Sims, Deputy Editor of Printmaking Today. Guest artists including David Shrigley and Billy Childish have also been invited to exhibit to represent artists working with print techniques and repetitive processes in a unique and successful way. 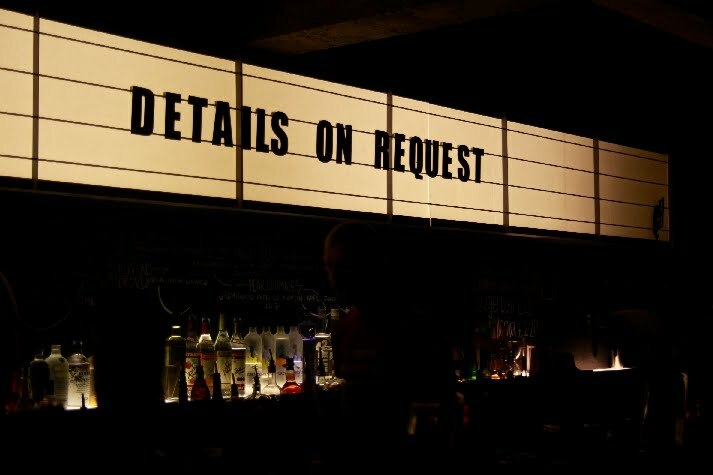 [Details on Request] are a curatorial team run by a group of practicing artists in East London with the aim to create networking and exhibiting opportunities for emerging artists. The projects run by [Details on Request] hope to encourage collaboration and create, for graduates, peer group learning which is so important for the development of an artist's practice. [Details on Request] hold a program of exhibitions, talks and group critiques in London and through out the UK. Recent events includePerformitivity as part of the Bath Fringe Festival,Tago Mago, an interactive live art and music night and Art In The Park, a live art performance platform in London Fields, East London. Please see below for forthcoming projects. Visual Paradigms is a online, open source project for visual artists exploring the links between contemporary art practice and art writing run by [Details on Request]. The exhibition will be exploring ideas between communication, personal reactions to art and the complexities of interpreting language through a reworking of the surrealist game of the Exquisite Corpse. Seven writers have been invited to produce a piece of writing about seven different images chosen by the curators; in turn, artists are now invited to submit original works to the project that they believe reflect or are inspired by thetexts. Works from all mediums will be accepted whether it be painting, sculpture, performance, video, audio or other. See T&C for information on how to submit work. For more information please see the Visual Paradigms website. An online, open source project for visual artists exploring the links between contemporary art practice and art writing. Please see website to find out how you can be involved. Music and live art night with Baron and Henry's Phonograph. And music from Orchestra Elastique and Happy Home. A regular event for artists to meet and discuss new works in an informal setting. [Details on Request] co-curated an evening of music, live art and interventions. A series of seminars looking at the ways in which we learn and the success of them. Held by Glyn Read, Chairman of the Virtalis Group of Companies. Talks and discussions around the themes of collecting and how this can be used to inform artistic practice. A fun evening of films, drinks and chats. A performance exhibition where a sweatshop of artisans are forced to churn out creative talent by the hour.